If you're a qualified scuba diver wanting an unrivalled experience with one of the very best Shark Diving Company's on the Cape Whale Coast, look no further. Marine Dynamics have introduced a brand new pelagic dive. Experience Mako & Blue Shark off the coast of Gansbaai. Ficks Pool is situated directly in front of 7 On Marine, one of the several marine tidal pools dotted along the Cliff Paths of Hermanus. Simply follow the steps from the Cliff Path down to the pool for a refreshing dip. 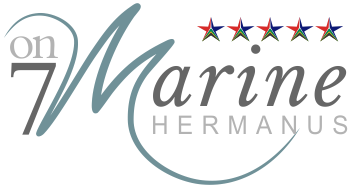 Hermanus is renowned for its magnificent beaches especially Grotto Beach which is consistently awarded Blue Flag status. Along the shorlines of the whale coast in Hermanus are secluded beaches some with beautiful rockpools, ideal for kids to explore and play in, stunning picnic areas for leisurely family picnics and some beaches offering great surf spots. Book a paragliding flight with Walker Bay Adventures and take in an eagle eye tour over Hermanus for the most breath taking views of our beautiful coastal town. Tandem paragliding tours are undertaken by Parapax who have been operational since 1999. Hermanus offers an enormous variety of top class restaurants in every possible style you can think of. Click to find out more and try out some of our recommendations which will not dissappoint. Boat based whale watching is a must when visiting Hermanus during the months from June to December. Experience this close up encounter with these gentle giants of the deep with the professionals at Southern Right Charters. Visit the award winning wine farms and eateries in the Hemel-en-Aarde Valley, some of which have outstanding restaurants serving dishes sure to tantalise your taste buds.